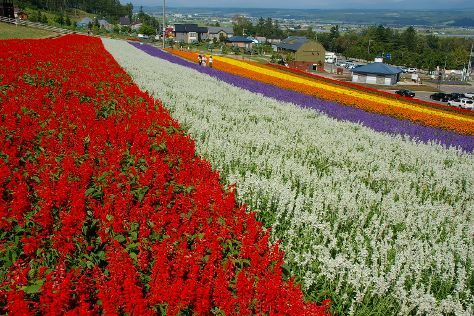 Flower-viewing tourism draws flocks of visitors to Nakafurano-cho, a Hokkaido town famed for its many lavander fields. Farms, parks, and fields covered with blooming flowers dot the landscape of the small town, making for scenic viewpoints, picnic spots, and postcard-like photo backgrounds. Since it's free to roam the verdant parks and admire the flowers, a trip to Nakafurano-cho is a good option for the budget-conscious. Visit from June to September for the optimal flower blooming season. Nakafurano-cho is in Sorachi-gun. Our Japan trip website allows you to plan your trip to Nakafurano-cho and a wealth of other destinations big and small. A couple of mid-range and budget friendly establishments concentrate around Nakafurano-cho's train station, including affordable dormitory-style hostels and traditional Japanese "ryokan" inns. Just a couple of train stops away, the larger town of Furano boasts a wider variety of accommodation options, from luxurious high-end hotels to unassumming lodgings with "tatami" floors, mostly scattered near the town's ski resorts.